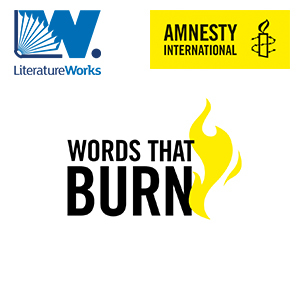 Literature Works is delighted to be partnering with Amnesty International to support and facilitate the delivery of Words That Burn in schools. Words That Burn is a national project for young people to explore and express human rights through poetry, established and piloted in partnership with Cheltenham Festival. Secondary schools receive a different Human Rights theme each academic year, along with accompanying educational resources designed to help students develop their own writing and performance style. We are pleased to be supporting the project by working with schools in Plymouth to deliver Words That Burn sessions with students in secondary schools. A selection of poetry is written by students, using the framework of Amnesty International’s free and downloadable session resources for the project. In becoming involved with the project, students respond to a variety of poets and poems from the literary canon and contemporary poets who are writing on the subject of human rights. Students then choose to write poems of solidarity or protest in response to issues surrounding human rights. Importantly, students will respond to real cases of people on an international scale whose human rights are in jeopardy. Poetry created by the students will then be displayed on this page and forwarded to Amnesty International who will pass them on to those affected by the human rights violations in an act of solidarity or, where possible, the perpetrators of the violations in an act of protest. Additionally, students are challenged to ‘make a difference in a minute’ and send in films of themselves reading their poetry in a minute or less. This is a challenge which is open to all young people. We will be using this page to share the work of the schools we are supporting. Watch this space. For further information on the project, please visit the Amnesty International website.